…a scrapyard on Chicago’s southeast side houses a permanent resident? A lot of things get thrown out in junkyards, sometimes, even a human being. Andreas von Zirngibl, which should easily be the best name you’ve heard today, was born in 1797 in Bavaria. He fought against Napoleon in Waterloo, although not without losing an arm. In 1854, von Zirngibl took his family across the sea and rested on the shores of the Calumet River. 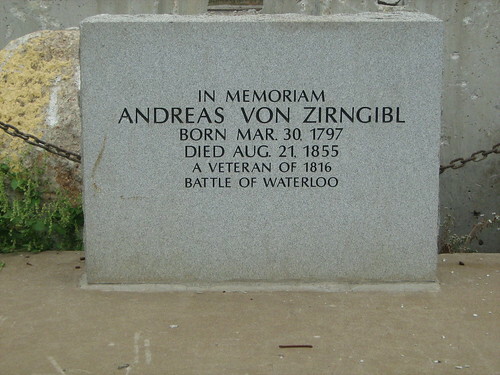 When von Zirngibl died in 1855 from a fever, he asked that he be buried on his land. Easy enough request, considering it was a sparsely-populated swamp. As it does, though, time swept along this landscape, bringing with it the Industrial Revolution. Eventually the Calumet and Chicago Canal & Dock Co. encroached on von Zirngibl’s gravesite, prompting his descendants to sue. Despite suspect claims to the land itself, the judge allowed the burial place to remain, with access granted to relatives for upkeep. The ruling applied to any future company on the site. That’s why SIMS Metal Management still has, among crushed cars and mounds of tires, a pristine slab with von Zirngibl’s headstone on it, surrounded by four huge concrete blocks. It’s not the original headstone; a wayward crane smashed one of its incarnations in 1999. The veteran’s grave is certainly one for any curious Chicagoan’s bucket list, but check with the company before you waltz in: they should let you in, if you have the appropriate safety precautions. As the saying goes, always wear your helmet. Bonus goodie: everything’s on Yelp these days. Join us next week when go down the Mississipp’ to a haunted French fortress! I had never heard this, how interesting. And not too far from my Bridgeport home, hehe. your mission is to check this grave out and report back. Haha, I’ll see what I can do. Hehe~ I’m related to this guy. He’s my great great great great great grandfather (Theres probably more greats to that). Glad to see I can add Prussian desent to my list.